Out with the old and in with the new! 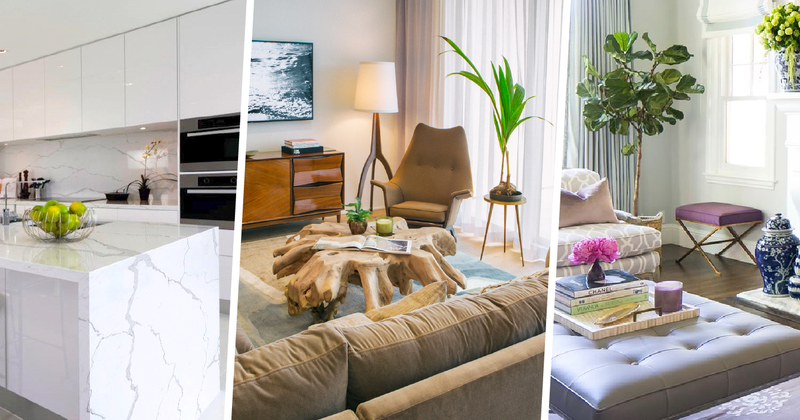 While every new year offers an opportunity for new beginnings, it’s also a great time to consider a fresh look to brighten up real estate investments and align with the latest trends. Rena Anderson, a Premier Property Group (PPG) design consultant, offers some insight into what’s on the horizon in 2019 for new construction along with effective ways to update an existing look. Paint –A simple new color can dramatically change the mood and look of any home. In 2019, look for warmer palettes to begin replacing the cool whites and grays that saturated the design industry in recent years. Anderson suggests shifting to warmer whites with matte black as a strong accent and jewel or primary colors for bold pops of color. Consumer Reports – Hottest Interior Paint Colors of 2019 coins the phrase “restorative power of nature” in revealing the inspiration behind the leading color selections for 2019. For our coastal market, Anderson says that hues derived from the palest grains of sand to the boldest Caribbean blue and tropical greens will soon begin surfacing on walls, fabrics and accessories. Green/Eco-Friendly Options – In tandem with greater focus on the environment, “green” interior options are becoming readily available. Wood flooring harvested from sustainable forests, recycled and engineered woods are very popular—hence PPG’s use of Naturally Aged engineered European white oak flooring in residences at Thirty One on 30A. While trends in countertops have run the gamut from laminates to granite, marble and quartz, the new kid on the block in 2019 is large format porcelain. Fabricated in large 5’ x 11’ slabs and a thin 6mm profile, Anderson says these options make a perfect remodeling alternative and can be installed on top of an existing countertop. “It tolerates extremely high temperatures and is non-porous, which translates to an antimicrobial surface that is also scratch and chemical resistant,” she notes. Durability/Low Maintenance – Because salt, sea and sand are harsh to most flooring products, Anderson says that new “wood-look” luxury vinyl plank flooring is becoming a serious contender against porcelain, hardwood and stone. “Soap and water are all that’s required for maintenance as homeowners at PPG’s Miller’s Landing development are discovering to their delight,” she said. Also, recent demands placed on the textile and furniture industry have resulted in fabrics once considered “bullet-proof and outdoor” to be used for indoor upholstery. Anderson pointed to Sunbrella and Perennials, like the fabrics used in the lobbies of Vista Del Mar and Thirty One on 30A, as some of her top choices when designing commercial spaces, noting that the texture, colors and pattern options have expanded greatly.